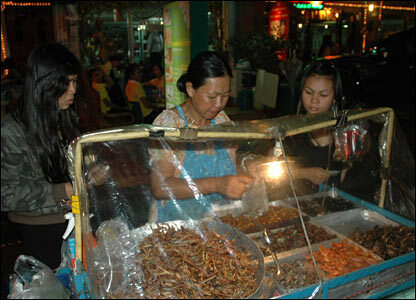 The BBC has provided a pictorial about Areerat Jantao, a street vendor who sells fried insects in Bangkok. Areerat said most of her customers were go-go and bar girls working in Bangkok's entertainment districts, although the snacks are also becoming popular among Asian and Middle Eastern tourists. As for her favorite selection, Areerat opted for the roaches. “I prefer a type of cockroach with lots of sticky eggs inside, which makes them very tasty,” Areerat said.